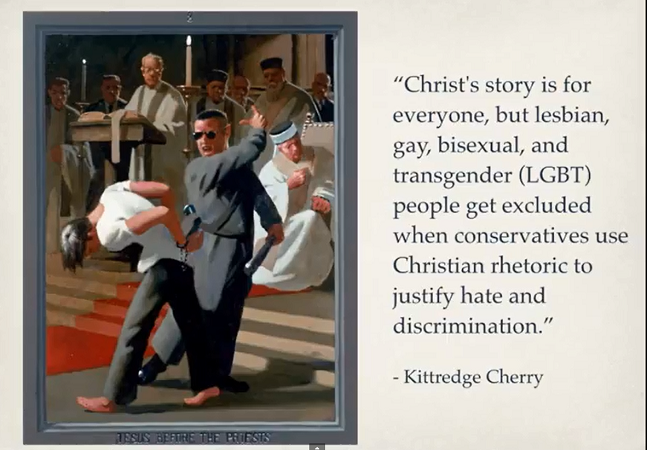 A new video introduces the queer Christ in an accessible, inviting way with LGBT Christian art and short quotes from queer theologians, including Jesus in Love founder Kittredge Cherry. The “Introduction to the Queer Christ” video was created by Sara Shisler Goff for the Slate Project, a an Baltimore-based online Christian community that she co-founded. The video was produced for the Slate Project's “ReLENT” series of Lenten reflections. They use the latest technology to explore ancient spiritual truths. Each week their videos, social media, Twitter chats, and in-the-flesh gatherings focus each week on a different side of Christ each week: Black Christ, the Poor Christ, the Queer Christ, the Feminist Christ, the Disabled Christ and the Nonviolent Christ. The Queer Christ video highlights quotes from Cherry's book “Art That Dares: Gay Jesus, Woman Christ, and More” along with texts from gay theologian Patrick Cheng and transgender priest Shannon Kearns. Their words appear with artwork by a variety of historical and contemporary artists, including Jesus in Love contributors Doug Blanchard, Becki Jayne Harrelson, Robert Lentz, Elisabeth Ohlson Wallin, Christine Bakke, Bill Burch, Carlos Latuff, and Dirk Vanden. The soundtrack sets a tone of sacred openness with the chant “Open My Heart” from the album “Inside Chants” by Harc (Ana Hernandez and Ruth Cunningham). Shisler Goff is one of three co-pastors who founded the Slate Project in 2013. She also serves as assisting priest at Trinity Episcopal Church in Towson, MD. “The Slate Project is a community, both online and in person, where we ask ourselves, ‘What if we had a blank slate for doing and being church?’ This lets us ask what it is in our Christian traditions that no longer serves us and needs to be ‘wiped away,’ and what is in the slate itself -- the very form and substance of what it means to be the church. Jesus is that substance,” she told the Jesus in Love Blog. She joined forces with pastors from two other denominations -- Presbyterian Jenn DiFrancesco and Lutheran Jason Chesnut -- to build a post-denominational community whose playfully irreverent motto is “Christianity without the crap.” About 1,800 people have “liked” their Facebook page and they have more than 500 followers on Twitter. “For me the queer Christ is about Jesus embodying God’s radically inclusive love for all people,” she explains in a separate video interview about the queer Christ produced for ReLENT. The Twitter chat about the queer Christ opened with Shisler Goff tweeting the Rainbow Christ Prayer by Cherry and Cheng. A record of the whole chat is online at Storify.com. The following highlights include questions and some of the most “favorited” answers from an hour of tweets. For you, how does the #QueerChrist set free and heal damage that has been done? 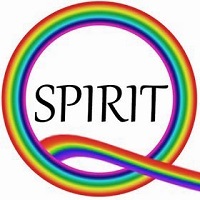 How do you experience the #QueerChrist—theologically, emotionally, spiritually, imaginatively? What do you think of the role of art as both an expression of faith and an agent of change? Cherry tweeted along too in her first-ever Twitter chat. “It was a thrill to use a new technology to meet new people who seek to know the queer Christ,” she said. “It was important to me that we talk about the Queer Christ for several reasons. I think many people are still not that familiar with the Queer Christ. Scholarship on the Queer Christ is still relatively new. It was not until I began my doctoral studies at Episcopal Divinity School in the last two years that I seriously studied the Queer Christ. For me, Jesus is the embodiment of God's radically inclusive love. This is the language of many queer theologians. The Queer Christ helps us transform unhelpful and limiting binary thinking and opens up a freedom for all people, with many kinds of diversity, to be imaged in Christ. I like to think of the Queer Christ as transforming the boundaries that we like to put up; not destroying them but transforming them. This view of Christ subverts the most popular critiques of the church today- it is homophobic, hypocritical, and irrelevant. This Christ has something to say to the lived experience of LGBTQ people who have historically be oppressed, marginalized and even persecuted by the church. I think the Queer Christ can speak to all people, because to "queer" something is to interpret it in a new and normative, non-traditional way. Everyone is welcome to join in ReLENT’s “digital discipline” by meditating on selected scriptures and readings and responding online through their Facebook and Twitter accounts. They host a Twitter chat of the week’s topic every Thursday at 9 p.m. Eastern, using the hashtag #SlateSpeak. 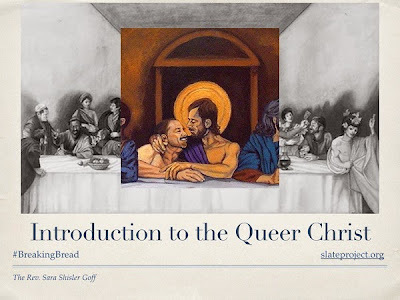 The ReLENT group has already discussed the theology of James Cone (Black Christ) and Gustavo Gutierrez (Poor Christ) as well as Cherry’s writing about the queer Christ. Upcoming weeks will focus on Dietrich Bonhoeffer (Nonviolent Christ), Nancy Eiesland (Disabled Christ) and various writers who discuss the Feminist Christ.